Originally founded in 1868 by Bishop John W. Beckwith in the Diocese of Georgia, Appleton has always focused on the needs of children. 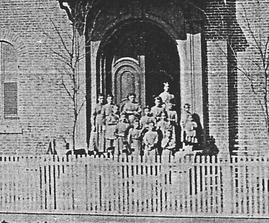 With generous financial assistance from benefactor William Appleton of New York, the Appleton Church Home opened in Macon in 1870 to serve orphan daughters of Confederate soldiers and quickly widened its doors to girls who were not orphaned, but whose families were challenged to care for them. In 1907, after the Diocese of Georgia split in half to form the Diocese of Atlanta in northern and central Georgia, Appleton came under the auspices of the Diocese of Atlanta . Over more than a century, the ministry evolved from an institutional facility to a group home model, and then to an outdoor therapeutic center. 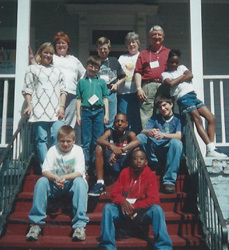 In 1992, Appleton began supporting after-school and summer programs for boys as well as girls. In January 2014, the Appleton Board of Governors was restructured and now includes representatives from each of the parishes in the Middle Georgia Convocation. These parishes include All Angels in Eatonton, St. Stephens in Milledgeville, Christ Church in Macon, St. Pauls in Macon, St. James in Macon, St. Francis in Macon, All Saints in Warner Robins, St. Christophers in Perry, St. Lukes in Fort Valley, St. Andrews in Fort Valley, and St. Marys in Montezuma. Together, these parishes work with Appleton's Missioner Julie Groce to multiply resources and expand the Episcopalian footprint of outreach ministry across middle Georgia by partnering with a diverse group of denominations, faiths, and community organizations. Appleton's office is located at St. Pauls Church in Macon, on the 1870 campus of the original Appleton Church Home. Appleton gains support for its programs and initiatives by several means. An endowment established early in Appleton's formation continues to grow and supplies the ministry with some income. Each of the ten parishes of the Middle Georgia Convocation contribute to Appleton's budget, as do private donors. In addition, an annual offering for Appleton Episcopal Ministries directed by diocesan Canon 24 is taken in all parishes "on Thanksgiving Day or between the Sundays preceding and following Thanksgiving Day, both inclusive."